Agate is one of the most varied and desired forms "chalcedony" which is one of the many varieties of quartz. Scientifically classified as a cryptocystalline or microcrystalline quartz, it has a hardness of 7. Quartz, in all its forms, is the single most abundant mineral on earth, making up almost 12% of the earth's crust. Quartz varieties are separated into two basic groups, macrocrystalline and microcrystalline. In macrocrystalline quartz the individual quartz crystals can be seen with the naked eye. In microcrystalline, sometimes called cryptocrystalline, the individual crystals are to small to be seen even under slight magnification. Agates and chalcedony in other forms, like chrysoprase and carnelian, jaspers and flints, are some of the cryptocrystalline forms of quartz. Some examples of the macrocrystalline forms of quartz are amethyst, ametrine, citrine, rose quartz, rutilated and smoky quartz. 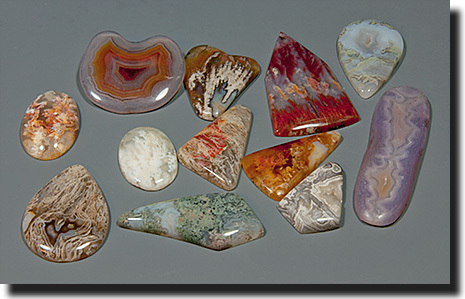 Agates in many different varieties are distributed worldwide but localities of agate beds of major significance only number less than a hundred.